Nervous Horse at the 4th of July? I know of some horses and even dogs that get so nervous on the 4th of July due to all the fireworks. 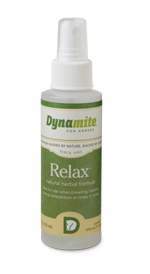 A great holistic product to help them out is “Relax” a product from Dynamite Marketing. I’ve given this product to horses, dogs and people to help them with fear or anxiety, in fact I use it at the shows to help me with the jitters right before I go in the ring. Another good holistic product that is a little stronger is “Tranquil” as I give this one for things like dentistry or a really nervous horse and I’ve used it to help me stay calmer for when I go to the dentist. The neat thing about both of these holistic products is that they have never made me drowsy. For Dogs: I have a young boarder collie that is pretty hyper so I give her the Relax and it really helps her to calm down. Our German Shepherd that we had was terrified of lightning so when I knew a storm was coming I gave him some Relax which really helped him to deal with the lightning better. Training Sessions: The other neat thing I’ve found is that by giving Relax to a horse right before their training session it has helped them to be more focused. Several years ago when we had foals we would give them Relax when working with them for their halter training sessions with amazing results. Both products are basically a homeopathic and I invite you to give them a try I think you will be amazed at the results! To order or for more information visit my Dynamite website I have 20+ years of working with holistic products for horses, dogs and people.